"If you ever left me, I'd tear my heart out & never put it back." That's a beautifully poetic quote from Adam Driver in Paterson, one of the year's best films. 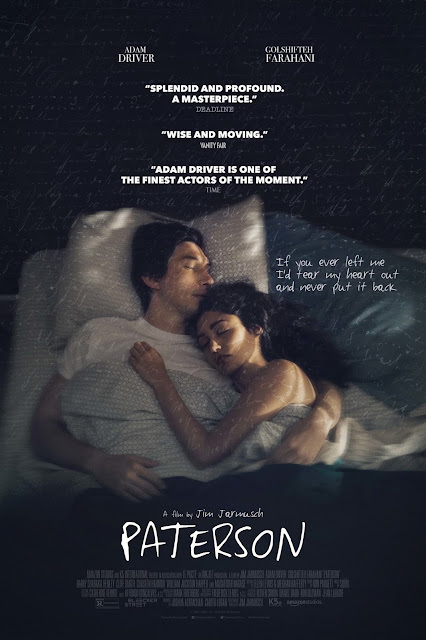 Driver plays Paterson, a bus driver & poet in Paterson, New Jersey. Every day follows the same pattern: he gets up, goes to work, writes some poetry, leaves work, takes his dog, Marvin, for a walk, goes to the bar & has exactly one beer, then goes home & goes to sleep. His wife, Laura (played by Golshifteh Farahani), is a woman of many changing interests: baking cupcakes, becoming a country singer, etc. She has been begging Paterson to publish or make copies of his poetry for a long time. But Paterson's life is about to be turned upside down. The cast is phenomenal. Jim Jarmusch's direction & screenplay are both excellent. This is an excellent look at the mundanity of life, showing that poetry truly can be found in the smallest aspects of life.